A World Heritage Site only accessible to the public since 1998, this tsingy offers an other-worldly experience. 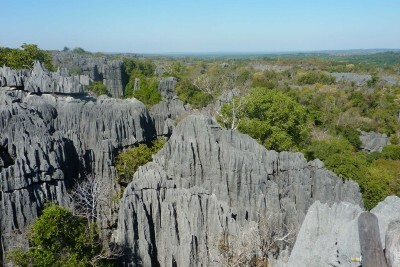 Visitors are surrounded by tall limestone pinnacles, some over 45m (150 feet) high, and can enter (sometimes via ropes) sunken dry deciduous forest harbouring unusual flora and fauna. Plants such as aloe, pachypodium and delonix cling to the jagged rocks. There is 86% general endemism in the park – a remarkable tally. Eleven species of lemur exist amidst the sunken forests and dense dry forests, including the endemic Randrianasolo sportive lemur and the white Decken’s sifaka which can occassionally be seen leaping between the tsingy piannacles. Excursions may involve walking, scrambling, climbing and caving over and under some wonderfully dramatic landscape. Peaceful exploration of the nearby Manambolo River gorges is possible by pirogue. Sixteen species of bat live in the area, and bird life on the river is plentiful, with 103 species including three couas and the Madagascar fish eagle. As well as being a place of strong fady (taboo), the locals believe the prehistoric inhabitants of Madagascar, known as Vazimba, inhabited the region. A tomb with apparent Vazimba skeletons can be seen high up the sides of the gorge. 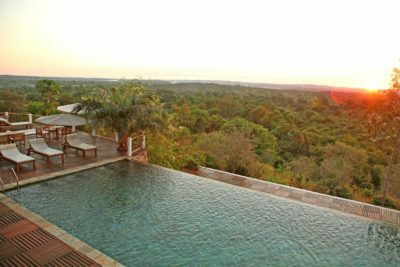 Bemaraha is accessed through Morondava and combines well with the iconic Avenue des Baobabs and Kirindy forest. Charter flights are available to take you direct from Bemaraha to Tana.